Following a couple of years where, uncharacteristically, he's released but a single recording, pianist Marc Copland returns to his usual, prolific self with Alone, his third 2009 album following the conclusion to his New York Trio Recordings trilogy, Vol. 3: Night Whispers, and Insight, his dark, intimate duet record with bassist Gary Peacock. Like the other two, Alone is also on the German Pirouet label, and the fact that Copland has parked his car permanently at Pirouet headquarters is no small endorsement, having recorded previously for other prestigious indie labels include Switzerland's Hatology, Germany's now-defunct Nagel-Heyer, and France's also sadly gone Sketch. It's also a well-deserved endorsement of Pirouet's commitment to Copland that the label is prepared to go the distance and release multiple discs in a single year. Copland's last solo piano disc, the marvelous Time Within Time (Hatology, 2005) was one of the year's best. It may be a late entry for the year, but in the arena of solo piano, Alone is an equal contender. Copland evolves gradually rather than breaking significant new ground with each record, and the development between Poetic Motion (Sketch, 2001) and Time can also be found in the four years that have ensued since Time. Terms like "impressionistic," "dark," "intimate," and "abstract" are all good ones to describe Copland's distinctive approach to whatever music he turns his hand to, but while his last two solo discs focused on original music and standards, the similarly configured Alone expands the repertoire by providing a very specific and unique focus on three Joni Mitchell tunes. Mitchell's inventive open tunings for guitar have provided grist for jazz interpretations in the past, notably Herbie Hancock's Grammy-winning River: The Joni Letters (Verve, 2007). But here, Copland draws from more obscure titles in Mitchell's early repertoire: "I Don't Know Where I Stand," from Clouds (Reprise, 1969), "Rainy Night House," from Ladies of the Canyon (Reprise, 1970, and "Michael from the Mountain," from Song to a Seagull (Reprise, 1968). What's, perhaps, most important is that these all come from before Mitchell began to dabble more explicitly in sophisticated jazz harmonies. Written more directly, that means Copland actually has more interpretive latitude, and he takes great advantage; the beauty of a Copland solo piano recital is that, while the non-original material is inevitably recognizable, his personal approach to reharmonization makes it sound very much as though he'd written it in the first place. Copland's original material continues to demonstrate a equally personal and oblique approach the blues ("Blackboard"), while expanding Night Whispers' title track into an 11-minute, indigo-shaded tour-de-force where everything the trio delivered explicitly becomes implicit, suggested. A newer tune, "Into the Silence," revolves around a 7/4 ostinato; another brooding piece where Copland's ability to paint vivid images in sound remains intact. He may be better-known in Europe, but Copland is one of America's too well-kept secrets. Those who've not yet been charmed by his inward-looking pianism couldn't start at a better place than the aptly titled Alone. Soul Eyes; I Don't Know Where I Stand; Night Whispers; Into the Silence; Rainy Night House; I Should Care; Fall; Blackboard; Michael From Mountain; Hi Li Hi Lo. Enrico Pieranunzi has proved himself to be one of the leading jazz pianists in Europe, primarily as a post-bop pianist who has recorded numerous CDs as a leader for various European and Japanese labels since his career took off during the mid-'90s. But this 2008 gig at Birdland in New York City reveals a different side, as it focuses on six Latin-flavored originals by Pieranunzi. He recruited a top-notch cast of supporting musicians, including trumpeter Diego Urcola; saxophonist Yosvany Terry; the young, in-demand drummer Antonio Sanchez; and veteran bassist John Patitucci. Pieranunzi's compositions blend the energy of Latin jazz with a singular infectious drive, particularly on his extended opener, "Danza 2," showcasing Urcola, Terry, and the composer in turn. The lovely Latin ballad "Rosa del Mare" is a subdued lyrical gem omitting the horns. Urcola nearly steals the show with his fiery solo in the lively "Danza Nueva," though Pieranunzi is no less impressive. Terry's emotional soprano sax is the centerpiece of the bittersweet ballad "Miradas." Enrico Pieranunzi's Latin Jazz Quintet will surely open the ears of his longtime fans, as those who were present at this enjoyable Birdland set can most certainly attest. Since the 1990s, Kurt Elling has proved a most innovative jazz singer. His recordings -- particularly The Messenger, Man in the Air, and Nightmoves -- also reveal him to be a modern jazz visionary. On The Gate, Elling presents nine songs gathered from rock, pop, soul, and jazz. Produced by Don Was, Elling is accompanied by longtime pianist Laurence Hobgood, saxophonist Bob Mintzer, guitarist John McLean, bassist John Pattitucci, alternating drummers Terreon Gulley and Kobie Watkins, and percussionist Lenny Castro. The material here is evocative of Elling's all encompassing view of jazz as an ever-innovative popular music. It opens with a subtle, deeply emotive and poetic reading of King Crimson's "Matte Kudasai." Commencing with only Patitucci's upright bass before Gulley and Hobgood enter from the edges, Elling croons languidly at the upper reaches of his range. McLean's guitar is used economically and delicately until his solo. Joe Jackson's "Steppin' Out" extends beyond the realm of the author's Cole Porter-influenced pop, transforming it into a warm, swinging, cool jazz number. The sparsity of Hobgood's phrasing underscoring Elling's voice shows remarkable restraint; Castro's hand percussion counters Watkins' hi-hat groove and makes it pop. Herbie Hancock's "Come Running to Me" changes shape entirely, from its funky fretless bass and vocoder roots comes a bona fide soul-jazz midtempo ballad. Stevie Wonder's "Golden Lady" backs off the funk; but the exacting interplay between Hobgood and Gulley keeps the soul intact; Elling reinvents it as an acoustic jazz ballad. The Beatles' "Norwegian Wood" subtly restructures the tune's rhythmic accents without forsaking a note of its melody. Earth, Wind & Fire's "After the Love Has Gone" is transformed into a limpid, nearly ethereal tone poem. The reading of Miles Davis' "Blue in Green" is based on Al Jarreau's arrangement, but it opens up more: space and texture grant his voice room to explore the melody's interior. "Samurai Cowboy," an original co-written with Marc Johnson, features Elling's multi-tracked vocals in a chanted chorus, underscoring a syncopated blues, highlighted by Mintzer's gritty fills. "Nighttown, Lady Bright" closes it as poetic, post-beat improvisation with Elling reciting as well as singing. The Gate presents Elling at the top of his game; it is a song cycle that is mesmerizing and mysterious as it is provocative and compelling. Well, by now everybody in the Jazz business, knows what a great artist Eliane Elias is. She 's a pianist, composer and singer, that made great records through out her career, but in some point, someone gave her the great idea to sing also. It was in my opinion a not so good one, it surely gave her more exposer and money, but the great Jazz she's always played was long gone. 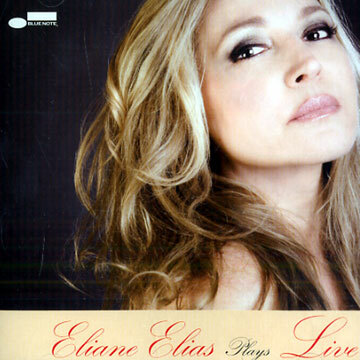 But now we do have great news, Eliane Elias is back as a Jazz pianist nothing more. Together with her longtime trio, her husband bassist Marc Johnson and the great Joey Baron. This Trio is swinging hard and playing wonderfully in this live recording at The Bimhuis, in Amsterdam, on May 31st 2002, only now available, it's a 2010 release by Blue Note Records. Eliane is one of my top Jazz pianist ! When she sets to make a great record or concert, she truly does. This is one the best CD's I heard this year, the sound is not that good, but still worth it, it was recorded by NPS( Netherlands Programme Service ) Radio. Don't waste more time, and start listening to a great Jazz Piano Trio playing at the top of their game. Plenty has happened since Enrico Rava last recorded with his working quintet. All but the piano chair remained stable between Easy Living (ECM, 2004) and The Words And The Days (ECM, 2007), but trombonist Gianluca Petrella is the sole remnant on Tribe. "Change is good," they say, and if the rest of Rava's quintet consists of largely fresh (and young) faces, the lack of name power shouldn't be mistaken for lack of firepower. In a post-show interview following a blistering set with his New York Days (ECM, 2009) quintet in Germany—part of Enjoy Jazz 2009's 40th anniversary ECM Record celebration—Rava alluded to being freer now than in the 1960s, no longer constrained, as he was, by free jazz's largely steadfast avoidance of time, changes and/or lyricism. Tribe celebrates true freedom, as the trumpeter's quintet—expanding to a sextet on four tracks with guitarist Giacomo Ancillotto—works its way through eleven compositions and a closing free improv that, in its haunting melancholy and unrepentant lyricism, is as strong an endorsement of Rava's asserted freedom as anything in the set. That's not to say it doesn't travel to more outré terrain, but the final minute of the aptly titled "Improvisation" reduces to just trumpet and trombone, Petrella creating a soft pedal tone over which Rava gradually hones in on a single note that, in its gradual fade to black, reflects a shared allegiance to both transparency and space, permitting the music to breathe, regardless of context. More than half of Tribe's eleven tracks come from past Rava releases—the relentless forward motion of the sketch-like title track dating back to 1977's The Plot (ECM)—lending an overall sense of consolidation, and irrefutable evidence that good writing never loses its relevancy. Rava's relationship with the near-vocally expressive Petrella (nearing a decade) is the fulcrum on which a more emergent chemistry pivots amidst, though tracks like "Cornettology"—from Rava's TATI (ECM, 2007) but actually going back to Secrets (Soul Note, 1987)—clarify a collaborative intelligence all the more remarkable for its relative nascency, and for the almost impossible musical maturity of bassist Gabriele Evangelista and pianist Giovanni Guidi, still in their mid-twenties. Rubato tone poems like "Song Tree" and the TATI-like trumpet/piano/drums trio of "Paris Baguette" juxtapose with haunting, time-based ballads like "Incognito" and the greater detail of "F. Express," where Ancillotto's Bill Frisell-like textural breadth quickly turns more overtly virtuosic. Rava is capable of great beauty, but even the bittersweet romanticism of "Planet Earth" (also from Secrets) isn't a given; once Petrella, Evangelista and drummer Fabrizio Sferra join the trumpeter and Giudi, it's not long before things dissolve into fierier freedom, despite the underscoring constant of Rava's inherent melodism. Were it not for all signs leading to even greater future heights for this significantly revamped lineup, the coalescence of a life's worth of experiences into some of the most cogent and creative music of his career would make Tribe an unequivocal zenith. Either way, it's one of the strongest albums of Rava's career, and certainly his best since returning to ECM in 2003 after a quarter century hiatus. Amnesia; Garbage Can Blues; Choctaw; Incognito; Cornettology; F. Express; Tears For Neda; Song Tree; Paris Baguette; Tribe; Improvisation. Enrico Rava: trumpet; Gianluca Petrella: trombone; Giovanni Guidi: piano; Gabriele Evangelista: double bass; Fabrizio Sferra: drums; Giacomo Ancillotto: guitar (1, 6-8).